There is probably no one on this planet who hasn’t yet heard of Butter Chicken. It is the face of Indian cuisine to the world; much like what Sachin Tendulkar is to Indian cricket or what Amitabh Bachchan is to Indian cinema. No one can miss the tender, succulent chicken chunks that are just seasoned in the right proportion, immersed in rich, tangy and creamy tomato gravy. 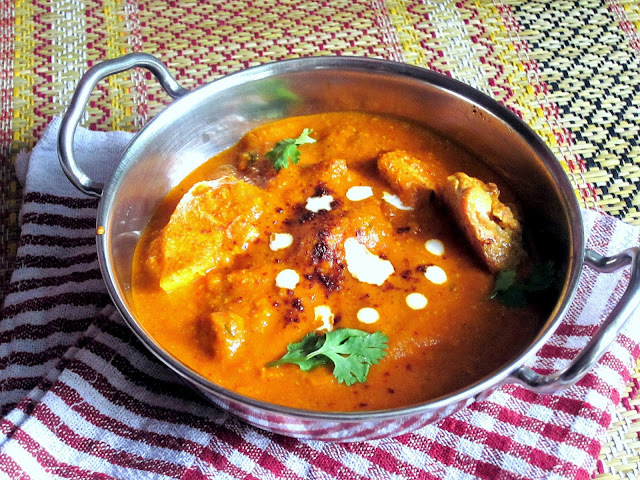 I might probably not be exaggerating when I say, that Butter Chicken is not just another dish, it is a cult in India. A dish that would only get better with age, a timeless classic. 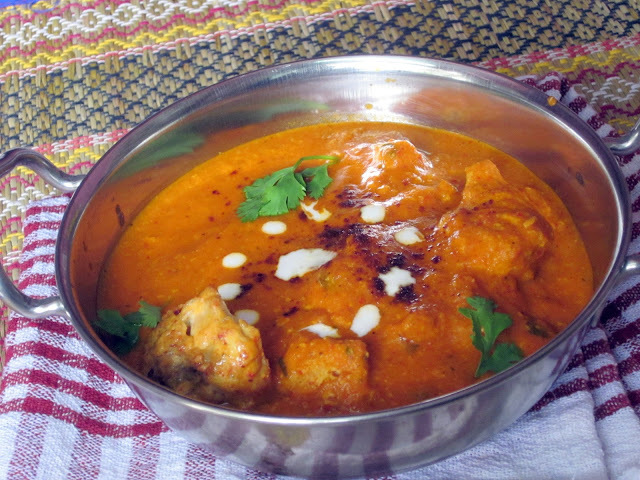 I have made butter chicken many times earlier, each version a bit different from the other, for instance I tried replacing the cream with full fat yogurt, left out the cashew paste, didn't grill the chicken and so on. The result? Nowhere close to the original. That is when I decided I would not compromise on any of the ingredients of ingredients and stick to the original version. This is not a dish that can be made every day, so indulge if you must, but remember to jog an extra round the next day! Butter Chicken, Jeera Rice and a plain vanilla ice cream completed the menu that Sunday. Coupled with a nice afternoon siesta; I couldn’t ask for more. 2 large tablespoons lemon juice. Combine all ingredients mentioned under "Marinade 1" and let the lemon juice and masalas to coat the chicken well. Refrigerate for about an hour. Whisk all ingredients mentioned under "Marinade 2" except the oil. Add in the chicken pieces that we had marinated earlier and mix well so that chicken pieces are covered well with the marinade. Add the mustard oil and give it a nice stir. Keep aside for at least one hour. Meanwhile, pre-heat oven for about 10 minutes at 100 C.
Once you've marinated the chicken for an hour, put the chicken on the skewers and grill at 300 C for 3 -4 minutes on each side, basting with butter in between. That's your chicken tandoori. Ready to be served as a snack as well. Heat the Butter in a pan and add the cardamom and mace and saute on medium heat till the spices are fragrant. Add the ginger and garlic pastes and stir continuously ensuring that the spices and paste don't burn. Now add the tomato puree, and the red chilli, garam masala and turmeric powders. Mix well. Now cover the vessel and reduce the heat to the low and let it cook for about 7-10 minutes. After about 10 minutes, you will see that the paste is mushy and has an almost dry consistency . Add some water (to suit your preferred gravy consistency) and cook for a 3-4 minutes. Keep in mind that at a later stage, we will be adding fresh cream which will thicken the gravy. Once the gravy is simmering, add the kasoori methi and the honey and mix well. Add the chicken tandoori pieces and mix well so that they are well covered with the gravy. When the gravy begins to simmer, put the heat off for about 5 minutes, add the fresh cream and mix well. This is done to prevent the cream from curdling in the high temperature of the vessel. Cook for another 7-10 mins on a slow flame. Garnish with fresh coriander leaves and serve hot with naan, roti or jeera rice.